Music to Hip-Hop. Jazz, Folk, Chamber Music, Gospel and Rock n Roll can also be found. There’s even a selection of more obscure genres like Honky-Tonk and Shaker. If your focus is biblical studies, there are books on the history of Christian Music, Spirituals and Amish Hymns! whether you desire to brush up on your theory skills or broaden your musical horizons. And do not forget our online resources, we have some great databases like Alexander Street Press and Naxos Music Library! These sources will allow you to find sheet music and to listen online to a huge library of music. So, do yourself a favor. Take a trip to our amazing library, and let the music begin ! There are many things that I have learned from being a student here at Cairn. Some of them I had to learn the hard way. Others were because I listened to some of my professors, friends who were upperclassmen, and other people who were important in my life. Looking back from the senior’s perspective, I wish I had listened to some more thoroughly. I would like to share with you some of the tips my friends and I learned. This may sound silly, but you can be surprised how far a little water can go. When your water intake is low, you may experience headaches or even exhaustion. Water even can help you with your digestion as well as helping your brain function well. One of the things that you hear about a lot in college is students who pull all-nighters before a test. This may not be your best option. Cramming all that information in your head tires you out, and then your brain has no time to process it. When you sleep, your body and brain are realigning everything from the day. As a result, the person who attempted the all-nighter will not be able to process the questions well on the test that they studied for – if they can read them at all. Several of my friends have not slept like they should and had trouble functioning the entire day sometimes have nearly passed out. Personally, I cannot function well in class or stay awake unless I have had a minimum of 7 hours, but that may be different for you. This one seems like another duh, but when you become busy as a college student, it is easy to skip meals. I really do not recommend skipping meals from personal experience. I had skipped breakfast a few times, and I always felt so hungry by 10am, or I felt sick. Several of my friends also had bad experiences with this. One of the mistakes that I made sophomore year was that I jumped into too much at one time. My grades showed it. I didn’t fail, but I didn’t do excellently either. If you know you are someone who stresses out too easily, don’t get too involved. There are going to be times where you have to skip an event to finish a paper. It happens. This one was a killer for me. I was told by a professor freshman year that I should start papers, especially big assignments, two weeks ahead of time. I wish I had listened to him. It would have saved me a lot of grief. Always have a time to study and a place. This helps a lot. For those who would like to study in the library, I am including the regular library hours in this post. This one may seem more like “Why do I have to do this?” I know. I have had that attitude. As a student, we feel saturated with Bible content because every semester we usually have one bible class. At times, I thought it was enough, but it never was. I felt emotionally and spiritually run down faster when I was not reading my bible. There are some things that you cannot get from Bible classes as well. God can speak personally to you through your bible study. There have been so many times this semester already that my bible readings have encouraged me when I was feeling down, or my trust of God was wearing too thin. Your personal time is when God wants to let you know that you can be still and know that He is God. The semester is coming to a close and soon we will be able to go home and enjoy our families, but there is one thing that I know that I have had trouble remembering for the past few years: Christmas. Some of you may not have thought about it because you still have over a month and figure you can do it when you get home. There are others though like me who prefer to be ahead of the game. I have two words for you: Book Sale. We have had the book sale going on at the library for a while and it is continuing until the end of the semester. The prices are $1 for hardback and $0.50 for a paperback, and however many you can fit into a plastic bag is $5. We have a wide selection of books. We have ones for the theology buff in your family as well as the history buff. There are some books on art. There are others on marriage and other family ties and more. Maybe you would find one that interested you. Why the book sale? Where else are you going to find books in good condition for this price and not have to deal with shipping rates? Especially since it is right on campus on the lower level of the library, you do not have to journey off campus looking for that special gift. So come on out and see what the book sale has to offer you and your loved ones. Once you have filled your bag or gotten your selection, take them to the front desk to pay for them. Then enjoy your Christmas break knowing you have completed part of your Christmas list. Hello, college students! We all have those cravings as the semester gets farther on. The more projects we have, the later we stay up, and the hungrier we get! The commuter (or student) lounge is a great spot to get some snacks with the convenience of the vending machines. Even the new ‘keurig-esque’ coffee maker has ‘pods’ available in the vending machine for a quick blast of caffeine! With all the studying that goes on, munchies are a constant companion to homework, along with music and Facebook. However, when you get the urge to bring some snacks with you to your next big study session in the library (because let’s face it, you can’t discipline yourself well enough in the dorm lounge to get work done), I urge you to please hold back! Our library is an awesome place with tons of books and resources that will save your life when all those research papers and projects come up. And that is why we have a ‘No food‘ rule in place. You are free to eat in the back stairwell or the front lobby, but not out in the actual library where the bookshelves are. 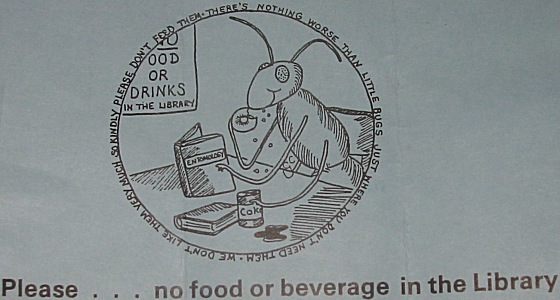 If you can resist bringing in your latest meal from Wawa, or that bag of pretzels that always gets you through a bind, you will be keeping bugs and other yucky insects from coming in and spoiling the peaceful, quiet study environment that is the library! Drinks are always welcome, as long as you have a lid, so we don’t spill on our nice carpet. But please, if you get the craving for some munchies, leave the library to eat your latest snack. That way you don’t distract the others around you with yummy food, and you won’t bring in bugs! Yay! See http://libguides.cairn.edu/hours for more details.